“Exit Lines” by Joan Barfoot. It can’t be easy to write a funny, provocative, as well as compassionate book about life in a Retirement Home. 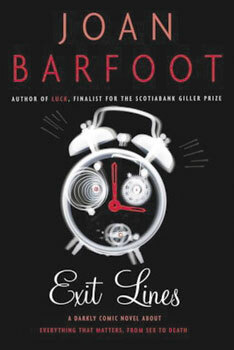 Joan Barfoot succeeds in Exit Lines. The Canadian novelist concentrates on four people, three women and one man, whose lives had crossed in varying degrees before they entered the Idyll Inn. The building sounds a bit like Ottawa, with a river, ducks and the occasional canoe. This group of people get together for a glass of wine and very quickly build up a kind of loyalty. This will be severely tested, as time goes by, by one of their member’s startling request. Events unfold that challenge this request. The unfolding story shows up Joan Barfoot’s skilful writing.